MHC proteins are found in all higher vertebrates. The glycoprotein encoded by human MHC is called human leukocyte antigen (HLA), which specifically presents short peptides to T cells and haves a key role in the immune defense of the body . HLA is a protein or antigen found on the surface of cells in the body. The HLA gene is a family of genes that encode HLA complexes. The HLA system and MHC help the body's immune system distinguish between autogenous and foreign or non-autogenous substances. The HLA antigen was first discovered by JeanDausset in 1958. MHC map to the short arm of chromosome 6, spanning about 3600 kilobase DNA , contains more than 200 genes . It is considered to be the most polymorphic genetic system in humans, providing the immune system with the ability to resist multiple antigens. These genes are all located on chromosome 6. According to the differences in antigen structure, function and tissue distribution, HLA/MHC genes are generally divided into three classes: class I, class II and class III. Composition: There are 3 major MHC class I genes and 3 minor MHC class I genes in HLA. 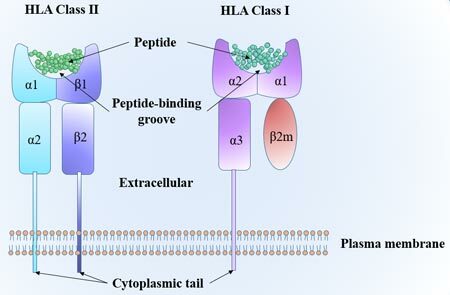 Major MHC class I: HLA-A, HLA-B, HLA-C. Secondary genes: HLA-E, HLA-F and HLA-G. Structure: HLA class I proteins consist of a transmembrane heavy chain and three extracellular domains (a1, a2, a3) and b2-microglobulin light chains. Function: HLA class I proteins present expired or defective intracellular proteins and peptides of invasive viruses to T cell receptors (TCR) on CD8+ T cells, resulting in an immune response. Tissue distribution: Almost all nucleated cell surface expression. 4β-chains are encoded by HLA-DRB1, DRB3, DRB4, and DRB5 sites. HLA-DM α - chain is encoded by HLA-DMA. β - chain is encoded by HLA-DMB. HLA-DO α - chain is encoded by HLA-DOA. β - chain is encoded by HLA-DOB. Structure: Each HLA class II protein consists of alpha - and beta - chains. Each chain has two extracellular domains. Function: Class II proteins and binding peptides interact with CD4+ T cells (usually helper cells) and their receptors. Tissue distribution: HLA class II protein expression was limited to immune-active cells, B lymphocytes, antigen presenting cells (APC) (monocytes, macrophages and dendritic cells) and activated T lymphocytes. In addition, the expression of other cells is also up-regulated in inflammatory environments. Proteins produced by HLA/MHC class III genes, including complementary components C2, C4 and factor B, tumor necrosis factor TNF, lymphotoxin and three heat shock proteins. They mainly play a role in the inflammatory response. Both HLA-I and HLA-II have an antigen-binding groove that allows for the binding of the processed peptide. The biological role of HLA class I and class II molecules is to provide antigens that have been processed. The most important function of HLA molecules is to induce, regulate immune responses and select T cell banks . Cells contain two different antigen-processing pathways that provide peptides to T cells. HLA class I molecules load peptides produced by the proteasome-degrading cytoplasmic protein on the endoplasmic reticulum. These HLA I/peptide complexes are surface expressed and presented to CD8+ T cells. The HLA class II molecule exits the endoplasmic reticulum together with the invariant chain (II) which bound to its peptide binding groove. During endocytosis, the invariant chain is degraded by proteases, and the class II related invariant chain peptide (CLIP) remains in the binding groove. 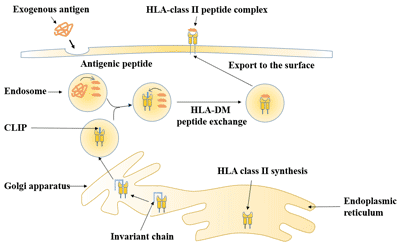 HLA-DM mediates the exchange of CLIP and antigenic peptides. HLA-class II peptide complexes are then transported to the cell surface and presented to CD4+ T cells. Therefore, HLA class I usually detects the intracellular environment, while HLA class II detects antigens present in the extracellular environment . The distribution of HLA antigens in different ethnic groups has a unique pattern. Take HLA-B27 as an example, which is a gene associated with the prevalence of AS. The areas with higher B27 positive rates are mainly American Columbia, the Indian population along the coast of Canada and Canadian Haida. The positive rate of B27 in other regions is as follows: It was 6%-8% in European and American Caucasians; less than 1% in Japan and Africa; in Chinese population is 4% ~ 8%. MHC gene is the most polymorphic gene in human genome (total HLA allele 13023; HLA I allele 9749 and HLA II allele 3274) . The specific information is shown in table 2 and table 3. The first view is that polymorphism is maintained by heterozygote dominance. Since HLA gene expression is codominant, HLA heterozygous expression of functional HLA protein types is absolutely more than homozygous expression. The second hypothesis is that HLA polymorphism is the result of frequency-dependent selection during evolution between pathogens and vertebrate immune systems. The polymorphism of MHC, on the one hand, is an obstacle to finding a match, and on the other hand, it enable the immune system to recognize any invading pathogens. Various HLA tests mainly include HLA typing, HLA antibody screening and identification. HLA genes play an important role in transplant rejection as well as infective and autoimmune diseases . For these reasons, accurate HLA typing is important both in clinical and research. HLA typing has been performed using a variety of techniques, such as serology, cellular and molecular analysis .With the birth of DNA sequencing and polymerase chain reaction (PCR), specific oligonucleotide probe hybridization, sequence specific primer amplification, sequence typing (SBT) and other molecular typing techniques have been developed. HLA antibody test: an HLA antibody test is performed on the recipient of a transplant to determine whether antibodies against the donor tissue or organ exist to determine whether they can be successfully transplanted to another individual. The clinical application of HLA is mainly the matching of donor and recipient in organ transplantation . Human leukocyte antigen (HLA) typing can be used to match patients and donors of bone marrow or cord blood transplantation. In bone marrow transplantation, the donor and the recipient must have the same or matching HLA gene, so that the transplantation can be successful and the donor tissue cannot be attacked or rejected by the recipient's immune system. In addition to the classical HLA-A, HLA-B and HLA-DR antigens, the role of HLA-C and HLA-DQ antigens in graft survival or sensitization is now well documented  . HLA molecular allelic typing is often performed to provide HLA class I and class II allele matching. HLA is closely related to blood transfusion, mainly due to the immune response of HLA. Due to the high immunogenicity of HLA antigen, HLA antibody can be produced by immunizing the body through pregnancy, blood transfusion, transplantation and other ways. Heterologous HLA immunization causes various problems in transfusion therapy, such as platelet transfusion refractoriness (RTR), febrile non-hemolytic transfusion (FNHTR), transfusion-related acute lung injury (TRA-LI), Transfusion-associated graft-versus-host disease (TA-GVHD). In order to avoid these situations, HLA detection very necessary HLA detection is required for this situation. HLA genotyping plays an important role in determining the immune compatibility between donor and recipient, and is also part of the diagnosis of some autoimmune diseases. HLA-B27 is a human leukocyte antigen and belongs to the MHC class I gene. In clinical work, B27 positive can help us diagnose ankylosing spondylitis (AS). However, the diagnosis of AS needs to be judged by combining clinical symptoms, physical examination, imaging examination and laboratory examination. HLA-B27 alone cannot diagnose and exclude AS. Nevertheless, B27 still has an important auxiliary value for the diagnosis of AS. Currently, there are four commonly used methods for B27 detection: flow cytometry, PCR-SSP, ELISA and microcytotoxic assay. Flow cytometry is currently the most ideal method to detect B27, and it is also recommended internationally to detect B27. Many HLA genes are linked to human diseases, including some autoimmune diseases and cancer. But the underlying mechanism has not been fully explained. HLA-B* 2702, HLA-B* 2705 are associated with ankylosing spondylitis (AS). HLA-DRB1 alleles (DRB1 * 04:01, DRB1 * 04:04 DRB1 * 04:05, DRB1 * 01:01) are associated with rheumatoid arthritis (RA) . Celiac disease are associated with HLA-DQB1*02. Type I diabetes is associated with HLA-DR3 . Psoriasis are associated with HLA-C. Multiple sclerosis are associated with HLA-DR2. Rheumatoid arthritis are associated with HLA-DR4. Many studies have shown that HLA alleles are associated with various aspects of HIV disease. Existing evidence indicates that HLA is the most important site for human HIV differential control . Kaslow et al. evaluated the role of HLA I alleles in HIV infection and found that HLA B27 and B57 were closely related to the slow progress of AIDS . HLA homozygous individuals are more likely to become infected with HIV than HLA heterozygous individuals. The reason is that individuals heterozygous at HLA sites will be able to provide T cells with a wider pool of antigenic peptides than homozygous individuals, thus exerting greater pressure on pathogens. Problems that can occur in pregnant women: recurrent miscarriage, pre-eclampsia, or hemolytic disease in the newborn. These conditions are considered to be an immune rejection. The mechanical barrier effect of the trophoblast. Inhibition of the maternal immune system during pregnancy. Deletion of HLA class I molecules in trophoblasts. Local immunosuppression mediated by Fas/FasL system. There is such an interesting phenomenon in fetal tissues: low HLA - C expression, lack of highly polymorphic HLA - A molecule. However, the tissues of fetal origin in the placenta expressed low polymorphism of HLA class I B molecules, HLA - E, HLA - F and HLA - G, which made people more and more interested in the immunological effects of these three proteins during pregnancy . Allergic drug reactions usually occur in low molecular weight drugs. There are several explanations for the mechanism of drug allergy associated with HLA. Drugs and their metabolites are too small to produce their own immunogenicity, but it can be used as a hapten to modify certain autologous proteins in the host, leading to immune recognition of the hapten produced: self - peptide complex as a new antigen . An example of drug haptens is penicillin, which has chemical activity and stable covalent binding with proteins or polypeptides to produce immunogenic self-proteins . Drugs can bridge TCR and HLA molecules without directly binding to peptide antigens. Drug complexes can directly activate the immune response of T cells without the need for specific peptide ligands . For example, sulfamethoxazole can bind non-covalently to antigen-presenting structures (such as TCR or HLA) and directly cause irritation of immune responses. There is a certain correlation between the human leukocyte antigen and mate selection . Individuals prefer to have a partner that is relatively different from their own HLA genotype. Choosing a different HLA partner can increase the heterozygosity of the offspring on HLA, potentially increasing the resistance of the offspring to the pathogen. Human life span may be directly related to the optimal function of the immune system. Studies conducted in mice have shown that HLA, which is known to control multiple immune functions, is associated with the lifespan of strains. But a conflicting results have been found in a number of cross-sectional studies comparing the frequency of HLA antigens in young and old people. Holoshitz J. The quest for better understanding of HLA-disease association: scenes from a road less travelled by [J]. Discovery Medicine, 2013, 16(87): 93-101. Beck S, Trowsdale J. THE HUMAN MAJOR HISTOCOMPATIBILITY COMPLEX: Lessons from the DNA Sequence [J]. Annu Rev Genomics Hum Genet, 2000, 1(1): 117-137. Jr C A J, Travers P, Walport M, et al. The major histocompatibility complex and its functions - Immunobiology - NCBI Bookshelf [J]. Garland Science, 2001. 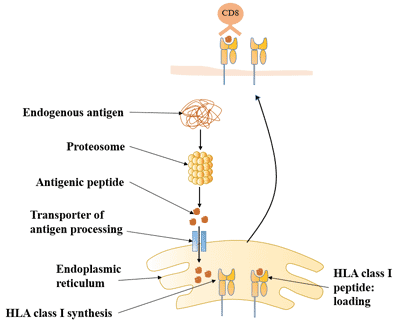 Shankarkumar U, Ghosh K, Mohanty D. The human leucocyte antigen (HLA) system [J]. Journal of the Association of Physicians of India, 2002, 50(50): 916. Wagner C S, Grotzke J E, Cresswell P. Intracellular events regulating cross-presentation [J]. Frontiers in Immunology, 2012, 3: 138. Robinson J, Halliwell J A, Hayhurst J D, et al. The IPD and IMGT/HLA database: allele variant databases [J]. Nucleic Acids Research, 2015, 43(D1): D423-D431. Matzaraki V, Kumar V, Wijmenga C, et al. The MHC locus and genetic susceptibility to autoimmune and infectious diseases [J]. Genome Biology, 2017, 18(1): 76. Lind C, Ferriola D, Mackiewicz K, et al. Next-generation sequencing: the solution for high-resolution, unambiguous human leukocyte antigen typing [J]. Human Immunology, 2010, 71(10): 0-1042. Bhadran Bose D W J, Campbell S B. Transplantation Antigens and Histocompatibility Matching [J]. Intech, 2013. Tran T H , Döhler, Bernd, Heinold A , et al. Deleterious Impact of Mismatching for Human Leukocyte Antigen-C in Presensitized Recipients of Kidney Transplants [J]. Transplantation, 2011, 92(4): 419. Tambur A R, Leventhal J R, Friedewald J J, et al. The Complexity of Human Leukocyte Antigen (HLA)-DQ Antibodies and Its Effect on Virtual Crossmatching [J]. Transplantation, 2016, 90(10): 1117-1124. Martin M P, Carrington M. Immunogenetics of HIV disease [J]. Immunological Reviews, 2013, 254(1): 245-264. Kaslow R A, Carrington M, Apple R, et al. Influence of combinations of human major histocompatibility complex genes on the course of HIV-1 infection [J]. Nature Medicine, 1996, 2(4): 405. Dahl M, Hviid T V F. Human leucocyte antigen class Ib molecules in pregnancy success and early pregnancy loss [J]. Human Reproduction Update, 2012, 18(1): 92. Yawalkar N, Pichler W J. Pathogenesis of Drug-Induced Exanthema [J]. International Archives of Allergy and Immunology, 2001, 124(1-3): 336-338. Warrington R. Drug allergy: causes and desensitization [J]. Human Vaccines & Immunotherapeutics, 2012, 8(10): 1513. Pichler W J, Beeler A, Keller M, et al. Pharmacological interaction of drugs with immune receptors: the p-i concept [J]. Allergology International, 2006, 55(1): 17-25. Havlicek J, Roberts S C. MHC-correlated mate choice in humans: A review [J]. Psychoneuroendocrinology,2009, 34(4): 497-512.